ANALYSIS: What's behind the tough talk from the American Federation of Teachers and Randi Weingarten? THE AMERICAN Federation of Teachers (AFT) leadership is straining to balance growing unrest among union members and their strategy of making concessions in the name of "partnership." That effort was on display at the union's convention July 11-14 in Los Angeles, where AFT President Randi Weingarten kicked off proceedings with a keynote address that denounced corporate education reformers as agents of the wealthy and powerful. 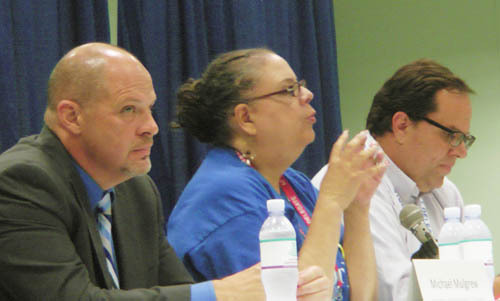 Above, Michael Mulgrew (President of the United Federation of Teachers, New York City), Karen Lewis (President of the Chicago Teachers Union) and Alex Caputo Pearl (President of the United Teachers of Los Angeles) were on the panel on "social movement unionism" during the 2014 AFT convention in Los Angeles. Substance photo by Norm Scott. "[I]f they embed austerity, privatization, polarization, deprofessionalization, who will call them out on it?" Weingarten declared. "Who will mobilize the fightback in America when there's rampant poverty and inequality, when the middle class is hanging on by a thread and the ladder of opportunity is more and more out of reach. That's what they want--to effectively silence us, to wipe us out." There's a significant change in the AFT leadership, too. Fran Lawrence, the former president of the Toledo Federation of Teachers, a local that prides itself on its willingness to identify and help terminate "ineffective" teachers , has stepped down as AFT executive vice president. Her newly elected replacement , Mary Cathryn Ricker, president of the St. Paul Federation of Teachers, cuts a very different image. Earlier this year, the St. Paul teachers conducted a strong and activist contract campaign. According to some AFT insiders, Ricker's elevation signals a shift towards a more assertive stand by a union that's been on the defensive for more than a decade. And certainly Weingarten's remarks to the delegates were a far cry from the speech she gave at the 2010 convention , when the AFT president declared that the union must "lead and propose" on questions of education reform -- and then wheeled out Bill Gates, whose foundation bankrolls much of corporate education reform, to make a similar speech of his own. Yet for all her militant rhetoric, Weingarten carefully sidelined discussion of the AFT's most important fightback in decades -- the 2012 Chicago Teachers Union (CTU) strike victory. CTU President Karen Lewis' time at the podium was kept to a minimum  and her role limited to introducing other speakers. Weingarten made only a brief mention of that critical battle. The message was unmistakable: It would be Weingarten, as AFT president, who would interpret the importance of the strike to the delegates, not Karen Lewis. Nor was there any mention of Lewis' possible run for mayor of Chicago, a race that would pit the CTU president against Rahm Emanuel, a nationally powerful Democrat who Weingarten has approached as a partner  in labor-backed public-private partnership for infrastructure development. Although Lewis is a member of the ruling Progressive Caucus in the AFT, she remains committed to the militancy of the CTU's governing Caucus of Rank-and-File Educators (CORE) and is famous for her blunt speaking about Corporate America and the attacks on public education. Evidently, Weingarten was worried that one of Lewis' typically fiery speeches to delegates might legitimize the CTU's militancy at the expense of Weingarten's pursuit of partnership with school district officials, politicians and the supposedly liberal elements of the education reform camp. NEVERTHELESS, THE growing divergence within the AFT couldn't be fully contained. After voting to oppose Common Core in their own local , CTU delegates to the convention mounted a fight to put the national union on record against the Common Core State Standards, a business-backed curriculum adopted by 45 states and the District of Columbia, which has sparked a growing opposition movement among teachers, parents and students across the U.S. The battle began in the AFT's Education Issues committee. The Progressive Caucus and its dominant faction, the Unity Caucus of New York City's United Federation of Teachers (UFT), mounted a counteroffensive against the CTU by adding its members to the committee to ensure that its proposed resolution to the convention would support Common Core. When CTU members arrived early at the committee meeting to stake out positions near the microphone, the meeting chairperson cleared the room. According to witnesses, when the doors reopened, UFT staff director Leroy Barr shoved Sarah Chambers of the CTU out of a seat near a microphone to make way for UFT President Michael Mulgrew. (Weingarten, from the podium, would mention the incident the next day -- omitting the names of those involved -- chalking it up to "passion" over the issue.) After a long and sharp debate, the Unity/Progressive Caucus prevailed, reporting out a resolution  that was somewhat critical of the implementation of Common Core, while recommitting the AFT to the project. If the Unity/Progressive caucus operatives are willing to literally throw their weight around to defend Common Core, it's because the quasi-national curriculum embodies the AFT's partnership strategy. The union participated in the drafting of the standards --and advertised itself as being "partners" with the Gates Foundation in that effort. Rejecting Common Core would have committed the AFT to a confrontational stance on education policy from the classroom to state capitals and Washington. Adding to the stakes in the Common Core fight was the fact that the issue contributed to a split earlier this year in the New York State United Teachers (NYSUT), the foundation of Unity/Progressive Caucus rule in the AFT. New York state's botched implementation of Common Core , along with a cap on property taxes that brought austerity to school districts across the state , spurred the incumbent NYSUT president to break with the UFT and launch an independent campaign that got 40 percent of the vote at a NYSUT convention. If the AFT convention had gone on record against Common Core, it could have further weakened Unity's control of NYSUT and loosened the Progressive Caucus' grip on the national union. SO WHEN Common Core came to the floor of the convention, the Unity/Progressive Caucus big guns were ready -- Mulgrew and Barr of the UFT, Keith Johnson of the Detroit Federation of Teachers, and others lined up at the microphones to speak. Still, what followed was one of the most spirited debates the union has seen in decades, according to AFT veterans. "I have watched my babies cry, 'No hablo ingles' and 'Why am I taking this test?'" said the CTU's Sarah Chambers, a special education teacher. "This is not helping my babies." Another CTU member, high school teacher Tim Meegan, also took to the floor. "Common Core is not about better outcomes for our kids," he said. "It is about aggregating a marketplace for test companies. " After about 45 minutes of debate -- a fraction of the time allotted to Democratic politicians to speak and the AFT's community outreach programs -- a solid majority of delegates voted for the official resolution. Nevertheless, a sizeable grouping of delegates beyond Chicago voted "no," a clear sign of membership discontent. A similar dynamic was on display in a debate over whether the AFT convention should follow the example of the other teachers' union, the National Education Association, in calling for the resignation of Secretary of Education Arne Duncan. AFT leaders sidestepped the vote, however, when United Educators of San Francisco President Dennis Kelly offered a substitute resolution calling for Duncan to be put on an "improvement plan," like those endured by teachers who receive poor ratings under the harsh new evaluation methods pushed by Duncan through the Obama administration's Race to the Top legislation. Amused, delegates voted to accept Kelly's language, sparing Weingarten the embarrassment of calling for the immediate ouster of Duncan, whose labor-management collaboration conferences between teachers and school districts Weingarten has enthusiastically embraced in the past . TO TRY and keep the union "fighting forward" -- the AFT's catchphrase for this year's convention -- Weingarten played up the union's successes, such as new contracts in higher education . Weingarten also celebrated the decision of the 34,000-member National Federation of Nurses to affiliate with the AFT, which, she said, was now the second-largest nurses' union in the AFT. After a lengthy discussion, delegates passed a resolution backing smaller nurse-to-patient ratios, following the example of National Nurses United. This special attention to nurses was likely an effort to inoculate AFT nurses from the influence of that rival union. Yet while noteworthy, these gains are far less important than the CTU strike, which held the line on against merit pay and defended tenure rights -- issues on which Weingarten personally negotiated concessions in local union contracts in New Haven, Baltimore and other cities. Tellingly, Weingarten wound down her keynote address by once again touting those agreements as models of teacher unionism. While she critiqued the recent Vergara v. California court decision that declared teacher tenure to be unconstitutional in the state, Weingarten then made it clear that the AFT would continue to trade away teacher job security. "It shouldn't take 10 years to litigate whether a teacher should be removed from the classroom," she said in her speech. In short, despite the rhetorical shift, AFT members can expect their leadership to stay the course on partnership, despite the disastrous results of recent contracts negotiated in recent years . But in the wake of the CTU strike, partnership has to be repackaged. For example, since Bill Gates, a key driver of Common Core, can no longer be credibly presented as a partner, the AFT leadership replaced him with a series of Democratic politicians, including California Gov. Jerry Brown and Los Angeles Mayor Eric Garcetti--even though Garcetti had just embraced the Vergara court decision on tenure. But Garcetti isn't the only AFT "partner" who lines up with teacher-bashers. Weingarten's new model for partnership is the recent contract negotiated her home local, the UFT in New York City. The deal implements many of the concessions  that the AFT has pushed across the U.S.: the introduction of merit pay (sold as a "career path") that fractures union solidarity; pay increases well below the rate of inflation; the introduction of up to 200 local school agreements that void most contract rules; and the undermining of job security for displaced teachers. Yet to Randi Weingarten, "fighting forward" apparently means embracing the New York contract as a template for the entire union. The supposed benefits of the deal were hammered home throughout the convention. New York City Mayor Bill de Blasio, whose administration negotiated the agreement, spoke to delegates through a recorded video message, following a breathless introduction by UFT President Mulgrew. Tellingly, actor Cynthia Nixon, who took to the podium as an education activist in New York, was the speaker to offer a more accurate assessment of the UFT contract. It was a deal, she said, that corporate education reformers would give their "eyeteeth" for. Moreover, Weingarten presented the de Blasio deal as part of a wider pro-teacher, pro-public education trend in the Democratic Party. Thus, the AFT has partnered with Democratic National Committee member Donna Brazile and former Michigan Gov. Jennifer Granholm to create Democrats for Public Education. But far from being a consistent defender of publication and teachers, Granholm, while in the governor's mansion, signed a bill to fast-track charter school expansion in that state . For her part, Brazile gave a rousing pro-teacher speech to AFT delegates. But back in 2007 , her solution to budget cuts in education was to "rattle some people, stir up some pots and find your Bill Gates" to fund it. THE CONVENTION proceedings were organized to marginalize critical voices. The Unity/Progressive Caucus control of the agenda kept delegates in the dark as to when the politicians' speechifying would stop, when convention business would resume and what issues would come to the floor. Thus, the emerging militant wing of the AFT had to find other places to express its views, off the convention floor. Important discussions took place in such venues as the AFT human rights committee luncheon, which featured Karen Lewis and Chicago community activist Jitu Brown, and meetings of the AFT Peace and Justice Caucus and U.S. Labor Against the War. The most widely anticipated side meeting, focused on social movement unionism, was sponsored by the CTU and United Teachers Los Angeles (UTLA), where the new Union Power slate had taken office less than two weeks earlier. Apparently concerned that CTU and UTLA might constitute a pole of attraction for militant teachers dissatisfied with the AFT leadership, union officials embraced the meeting themselves -- and, as a result, added several more speakers, including Mary Cathryn Ricker of St. Paul and Mulgrew from New York City. The room was crowded, with standing room only. As one attendee explained to others seated nearby, the UFT Unity Caucus had "ordered" its members to attend. Because of the format--presentations by seven panelists, followed by "table talk" by delegates who then submitted questions--debate was limited. Weingarten herself stopped by to make comments from the podium, saying that she was so happy about that meeting that there were "tears in my eyes." It was unclear if the AFT president was moved by the content of discussion or the loyalty and discipline of her caucus. Despite the restrictive format, the differences were clear. Karen Lewis described her union's efforts to mobilize members and reach out to the community to prepare for the strike, while UTLA President Alex Caputo-Pearl spoke about similar efforts underway in Los Angeles, which will include strike preparation in that city as well. The UFT president also claimed credit for mobilizing against school closures, when in fact nearly all such initiatives were taken by groups like the Grassroots Education Movement and Occupy the DOE  [Department of Education]. Many activists from those groups went on to found the Movement of Rank-and-File Educators (MORE), which in part took inspiration from the CTU's CORE. In the 2013 UFT elections, MORE candidates captured about 40 percent of the vote , with Mulgrew's Unity machine increasingly reliant on retiree votes to pad its margin of victory. Mulgrew also touted the new UFT contract's provision allowing teachers at 200 schools--around 20 percent of the total--to vote away decades of union rules and job protections. "You cannot touch your wages or seniority rights," Mulgrew said he told his union's members. "After that, I'm open." By contrast, Lewis and Caputo-Pearl, while avoiding any direct criticism of the UFT or AFT leadership, made it clear that they see holding the line on such concessions as an imperative. In her concluding comments, Lewis said that the CTU had for the past two years been sending members and staffers around the U.S. to help other locals. And Caputo-Pearl credited CORE with setting an example for his local to follow as it attempts to reverse years of decline in membership due to the proliferation of charter schools as well as concessions on wages and working conditions. He also alluded to the national network of teacher activists that is looking for a strategy on how to fight back --something that the AFT and NEA leadership has been unable or unwilling to do. The emerging militant network, however, remains small. Certainly, it doesn't figure in union electoral politics: Randi Weingarten and her slate won with only a symbolic challenge led by far-left union activists. Even so, the sharpening of internal debate in the union is noteworthy. The AFT leadership can only go so far in raising militant rhetoric while abandoning decades of contract gains. And the militants will, sooner or later, have to move from opposing particular policies like Common Core to challenging the union leadership itself. As the attacks on teachers and public education continue to mount, the stakes in that struggle will only continue to grow. [Editor's note. This article first appeared at socialist worker and is reprinted here at substancenews.net with permission. http://socialistworker.org/2014/07/22/whats-behind-tough-talk. Lee Sustar reports from Los Angeles on the recent convention of the AFT.. July 22, 2014. Originally Published by the International Socialist Organization. Material on the Socialist Worker Web site is licensed by SocialistWorker.org, under a Creative Commons (by-nc-nd 3.0)  license, except for articles that are republished with permission. Readers are welcome to share and use material belonging to this site for non-commercial purposes, as long as they are attributed to the author and SocialistWorker.org. ].